I’d like to give a belated Happy Thanksgiving to anyone reading this. I took this holiday as an opportunity to bring the vast majority of my card collection back to college. I somehow stuffed all of my remaining decks into a suitcase. I’ve evolved somewhat though. I now know I don’t need all of these decks (or more accurately the no longer standard legal, but too weak for Modern Magic decks) to be happy. Ever since offering my Standard deck for Jace, I’ve been slowly but surely taking apart all of my other block decks. Though I hope to have these decks live on as janky Modern decks. I’ve already made a Modern legal Sultai Planeswalker deck (where the BFZ Kioras wound up) and I hope to finally build a modern deck for Brutal Hordechief. He’s still my favorite FRF card, though probably the worst MTG investment I’ve ever made as Hordechief’s price has dropped to nothing. 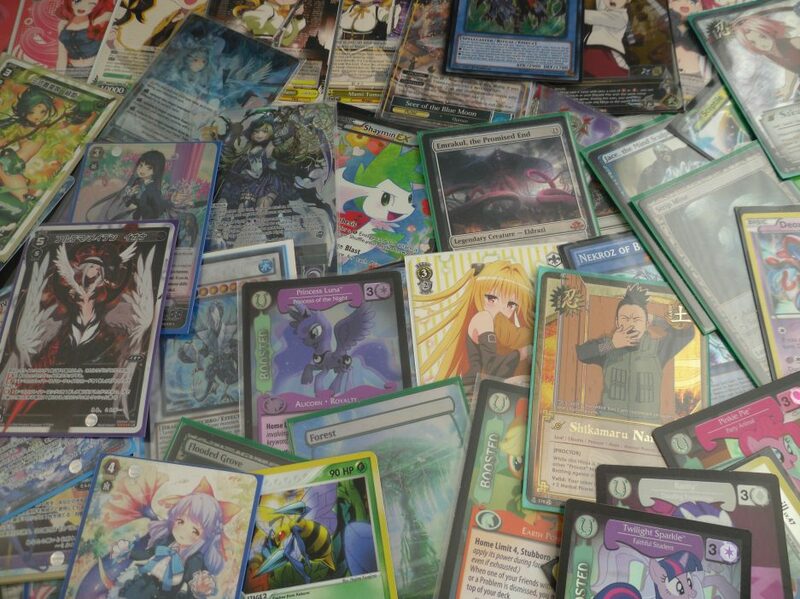 My main goal though is to sell these older decks/cards to afford more FoW (and food/rent!). Especially since someone else probably can get more use out of them than me. 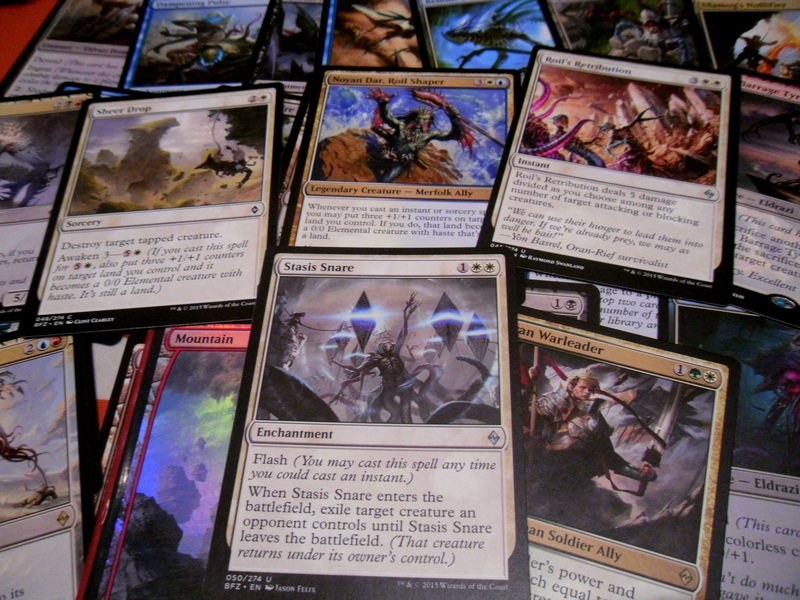 Some of these cards belong to my cousin who asked me to sell his MTG bulk for him as well. I’m pretty capable at selling cards at this point (at least Ygo and MTG). I’m not sure it’s a career, but it’s definitely a passion for me. I always keep in mind when I sell that these cards are all just unconverted money. Now the process of turning a card into money is not easy, but it’s far from impossible. My ebay seller level and tcg rating should be sufficient to prove I’m decent at this. Basically I may try to sell by commission in the future. I really love valuing card collections and selling them. Also I’ll do some posts to give people trying to move their own bulk some tips. Anyway, that’s enough ramble when homework still exists. Thanks for reading as usual. It’s hard to believe that almost 3 weeks have passed since the SCG open. Since then I’ve tried and I repeat TRIED to make Nekroz work under the new banlist. Though to be fair I’ve had a lot of success against my local play group running this build. This is definitely not the perfect new Nekroz deck, but I want to keep track of the evolution of my favorite deck. 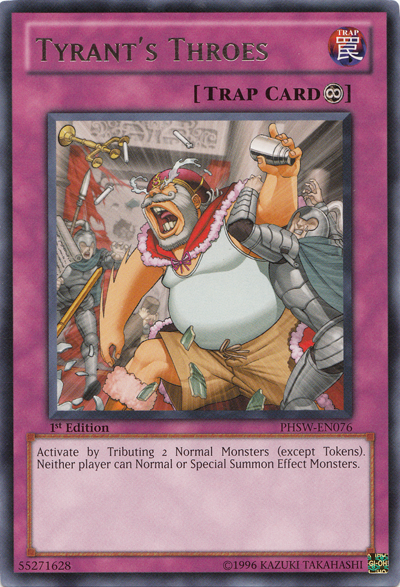 My grievance with Konami banning Shurit was that there was no longer any way to cheat out the high level Nekroz monsters. Essentially this would force you to ritual summon properly, which defeats the point of the deck since normal ritual summoning is incredibly minus to do. In order to overcome this problem I remade my deck focus entirely on using Kaleidoscope. This is why I added The Warrior Returning Alive to add back the Clausolas I discarded to add Kaleidoscope so I could use it immediately for a summon. This deck is lot more work, but the plays are much more satisfying. Tributing the Performages to either summon or draw cards with Valk is actually really great. Summoning Trish is pretty easy by going Brionac into Clausolas into Mirror (albeit I can only make Trish once per game and lose Brio with this line). Mathematician and Glow-up exist to make Herald of the Arc Light to protect the Kaleidoscope play. Also Herald gets so much value that I’d make it whenever able. Extra deck-wise I go into Daigusto Emeral more than anything else because obviously resources are limited. Incidentally, Glow-Up Bulb makes actually summoning the Synchro Trish possible, not very consistent, but just the possibility is enough. Sadly the dream of getting both Trishes out has yet to come to pass. I’ve lost more games to opening Trish, 2 Valk, Ritual Spell, and Warrior Returning Alive/Dark Hole than I’d like to admit. I’m not sure what to do other than swap out some of the monsters for Upstart Goblins (a card I really hate) in order to help the consistency. Honestly, Manju and Senju have become my favorite cards. Both are more necessary than before to make bad hands good. Also the simple Kaleidoscope Unicore play has become a godsend that I will never take for granted again. Floodgates still tear this deck apart so I probably need to more Mystical Space Typhoons to the main deck. This too brings up issues with what to cut. As we descend into the Pendulum era I really like Gungnir to police the scales on my opponent’s turn. I think Decisive Armor or the clowns would be first things to go, though Damage Juggler is really good at keeping you alive. I bricked game 1, OTK’d game 2 and got OTK’d game 3. Not that Yosenju have ever been a good match-up. Won game 1, lost to Powered Jersey game 2 and OTK’d game 3. My opponent used the German 6th place regional Nekroz decklist. It used Deep Sea Diva and Gishki Vision into order to summon the high level monsters in the same manner as Shurit. My build was much better suited to the mirror overall though. I may test this variant as it allows you to play Cycle at 3 (and I miss Cycle). All I recall is hiding behind Clausolas for 10+ turns. Gungnir saved Clau from Dark Hole, Trish saved him from Phoenix Wing, and Unicore revived Gungnir to get another save. The burned out Hero player was eventually taken down by Decisive Armor backed by Herald. I opened Unicore/Kaleido/Vanity’s too games in a row. Damage Juggler overachieved by killing Frightfur Leo, but that’s about all I can recall. I lost to traps and Triverr, nothing special. I sided Decree (my side deck isn’t complete so I left it out), but bricked with 2 of them in my opening hand. Lost to Lose 1 Turn, which hint is the floodgate that I need dead to play normally. I got out-advantaged by not using MST on his Pendulum scale Magical Abductor. It all went downhill from there. Still a lot of traps, but not enough aggression that I couldn’t fight through them. Nekroz stopped being easy and I doubt it will see much competitive play. I’ve had to struggle to win almost every duel if I didn’t open godly. This deck is still much better than Blackwings, but it feels the same in terms of being hated out of the meta. My message to you is that no Yugioh deck can or will be meta for more than a 1-2 years (Evilswarm?!?! Yeah no). Konami may not have a rotation system like Wizards does, but they’re beyond efficient at both printing cards and editing the ban list to hinder older decks. How do you deal with this? Therein lies the struggles of the budget player. Either you’re forced to shell out a couple hundred dollars every year on the next big deck or you have to struggle with the old jank, aggressively siding for the new best decks. I’m certain some people love this, but those same people would be Standard Magic players (i.e. someone willing to buy a new deck every few months). I love Yugioh, and I hope to never stop playing it. 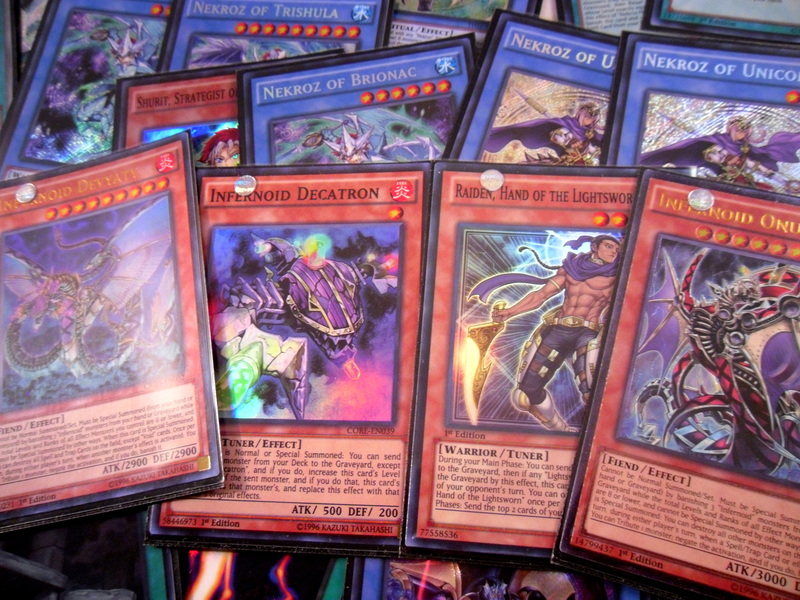 Also I still want to play competitively (because at the end of the day despite spending $300 to build this now $70 Nekroz deck I still haven’t learned) so I picked up a couple Infernoid Decatrons to finish that deck. However, that’s probably as far as I can or will go to keep with Konami at this point. Whenever I buy ygo these days, it’s almost always just to flip the cards for money anyway. 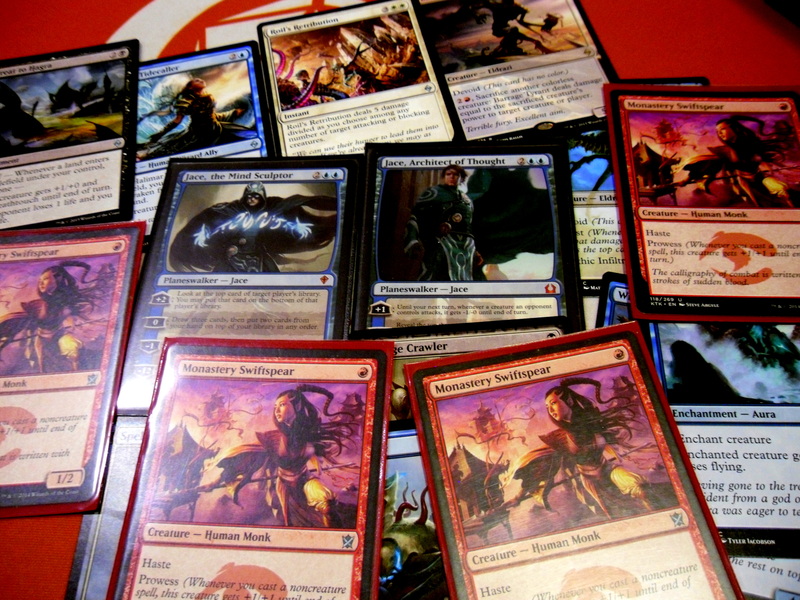 I’ve taken apart all of my Standard magic decks, foregoing them for EDH and Modern. I’ve also been playing more Force of Will than any other game recently. I’ll probably do a FoW related post next if it’s not just another post crying about the state of yugioh. I attended the Star City Games Standard Open yesterday. Of course with only the scraps of pre-BFZ Mono-red I couldn’t enter the actual event confidently. Instead I entered 2-Headed Giant BFZ Sealed with my roommate. We had high aspirations for the event. Unfortunately our hopes were quickly dashed by one of the most underwhelming card pools imaginable. and don’t even remember the last one. Despite this we still ended up building Red/Green Landfall and Blue/White Awaken. As would be a constant theme for the day our opponents ravaged us for the first 4 turns of the game before we made a significant board presence. The most foreboding moment being us at 13 life versus 30 life around turn 6-7. It got worse when our opponents dropped a Dragonmaster Outcast on us. 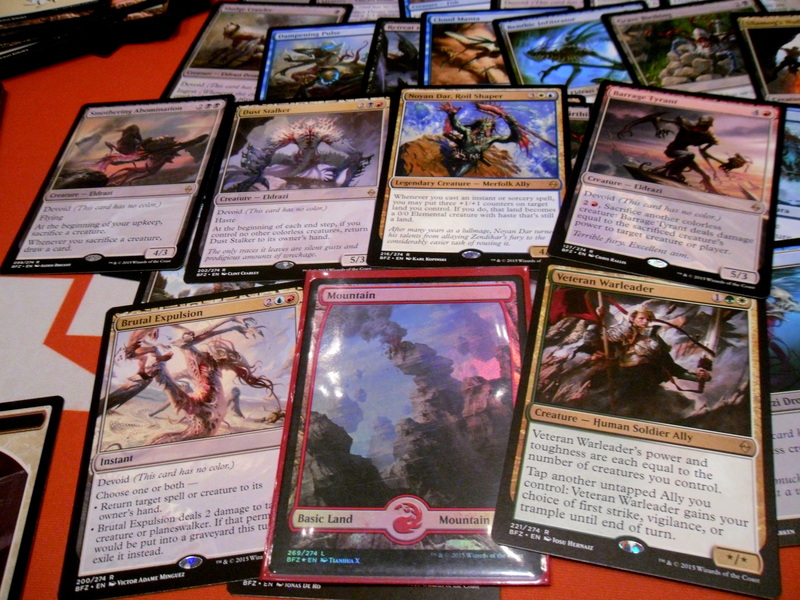 BUT then my roommate top-decked an Outnumber killing the Outcast after casting Ulamog’s Despoiler processed. Our opponents had run out of steam, did nothing and passed. I added Cloud Manta and Windrider Patrol to the board and got the consistent beats in the air while Despoiler and the later summoned Plated Crusher ran over their ground troops. We ultimately won the game thanks to this starling comeback. This game was pretty depressing overall. Our opponents got the card Retreat to Hagra (which is the second most broken card in 2HG that we dealt with that day) allowing them to get consistent attacks/damage in. Ultimately we made a ballsy play to get lethal that got ruined by Turn Against. We lost horribly as Breaker of Armies broke our Ulamog’s Despoiler instead of their horde of scions. Ok so getting processed consistently in the early game by the UW player wasn’t the issue. The problem in this game was Zulaport Cutthroat, who is the most broken card in 2HG (at least that we saw). Also once you combine that with Broodbutcher and Eldrazi Scions there’s not much simple piles of jank can do against it. We managed to kill the Cutthroat after losing 10 life to him, but our opponent used Dutiful Return to get it back. The last turn we stared down: Brood Butcher, 3 Scion tokens and the Cutthroat with only 11 life to our names. We died the following turn. 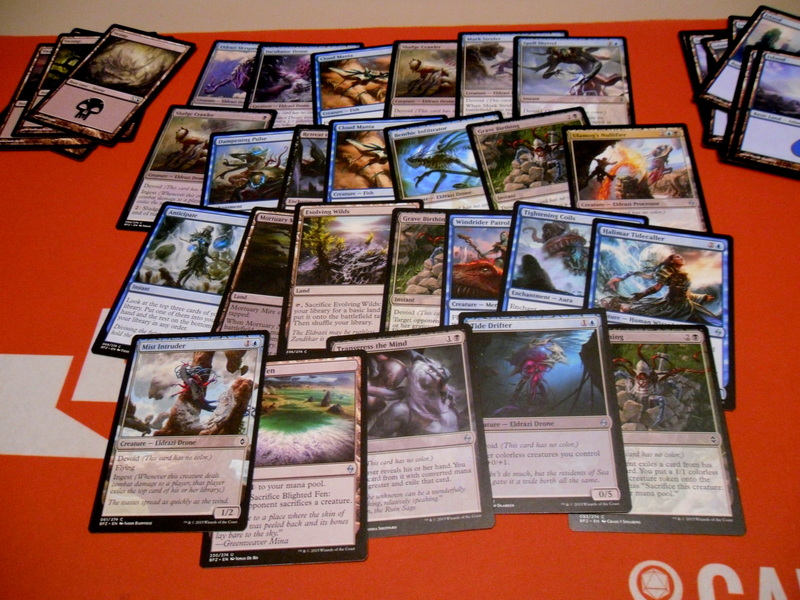 At this point fed up with our decks we radically built new decks before the final round. I became Blue/Black Control (adding Ulamog’s Nulifier and dropping Noyan Dar) and my roommate became Red/White Allies adding our 2 Retreat to Emeria and Lanturn Scout in exchange for the Eldrazi and Plated Crusher. Somehow how hasty switch was the correct decision as we steamrolled our last 2 opponents. The Jeskai player didn’t make a move until turn 6 while the Abzan player desperately blocked our allies and my Sludge Crawler, who not only ingested 3 cards, but also became a lethal threat in the late game. To be fair our opponents fought well (once Jeskai guy got online), but 11 life vs 48 life is not the place where you want to be. I learned from this that the early game is really important in 2-Headed Giant. We lost mostly due to being behind in board presence and life consistently. 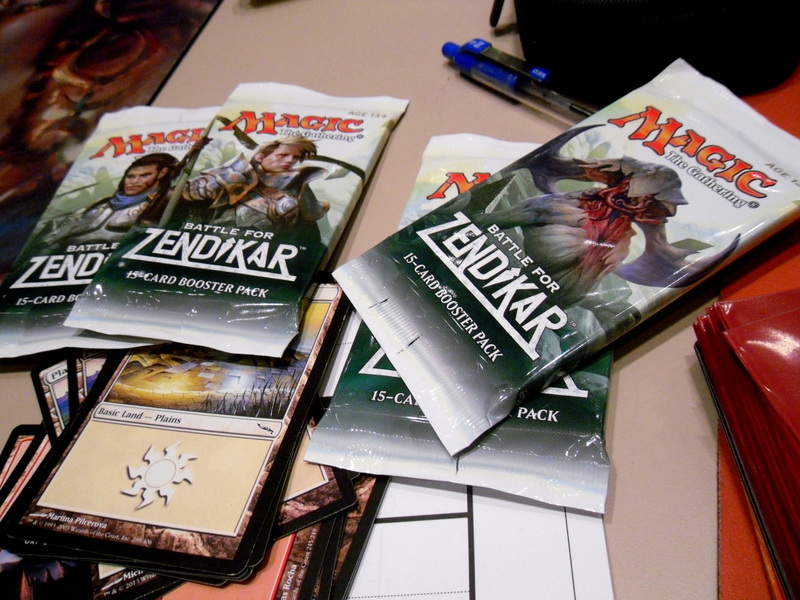 Overall this was still very fun and if possible I’d do this when the new magic sets come out instead of regular sealed. We won 2 packs each and opened nothing of value (though I guess the foil mountain is sweet). I guess expecting/wanting a Gideon was too greedy, but honestly these pulls were doubly brutal. Get it because we pulled a second Brutal Expulsion! My roommate bulked out his Standard staples to get 2 Expeditions. Following by example I decided it was finally time to send my Mono-Red Standard pieces away once and for all. At first I was going to get a Karn Liberated, but when the guy asked me if I wanted a Jace, Vryn’s Prodigy I got a slightly crazier idea. And so in exchange for my Standard deck and my Magic binder I got 1 Jace, the Mind Sculptor. I call this progress because I’ve long realized that Standard Magic is the most expensive format over time and currently is disturbingly pricey. I do love Standard mostly because it never seemed to have any broken cards or crazy combos. However, if you look at virtually any meta Standard deck right now they’re all comparable to Modern decks in price(I’m looking at you Jace). So rather than own Standard cards that would ultimately lose value after rotation or simply sit on cards I’m not actively using I figured it was a fine time to get a card that SHOULD hold value. I reconfirmed for myself that BFZ is fun sealed format and a painful money pit. The sad thing is I would defintiely do this again if given the opportunity. 2-Headed Giant is awesome and I’m very glad I got into it for events. I hope maybe some day I can play Standard again when cheap Mono-Red is a thing. Still if that doesn’t happen I know EDH will see me through. 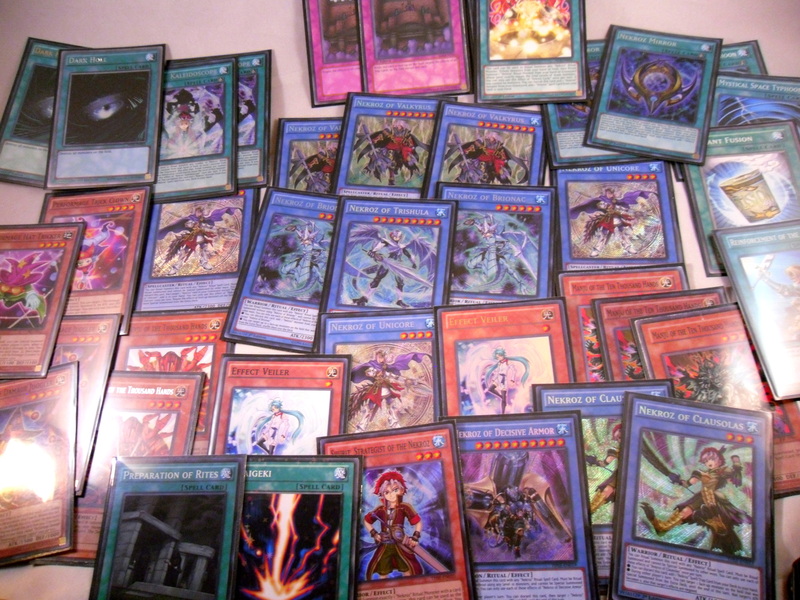 I adjusted my deck by which I mean I added Royal Decree and Dark Hole (I feared Dark Law too much). The irony being I didn’t played against the Hero player all night. I took game 1 despite my opponent faking Mirror Force like a boss. Game 2 I somehow lost under Royal Decree when my Ark that Ark’s his Delteros, got itself Ark’d (try saying that out loud). Game 3 he opened no traps and I won in 2 turns. My opponent was very nice and not too salty despite their noticeably bad luck. Game 1 was pretty back and forth (well as much as it can be against Qli). Decisive Armor got me the game even after being bounced by Helix, Carrier? One of those guys. He attacked my Unicore and I dropped the armor, pretty much buying me the duel. Game 2 I sided in Gungnir, while crying that I took out Fairy Wind before coming (Mistakes). However, Gungnir did her job policing the Pendulum Scale and I won as a result. My opponent was also fairly agreeable, making jokes the entire match. He also gave my back the Apoqliphort Towers I loaned him last week (It’s the little things that count!). So I never played against this deck before, but I learned how they work really fast. They search pendulum monsters by destroying themselves in order to make fodder to pendulum summon with. However Game 1 all that matter was a turn 2 Tyrant’s Throes. You can’t play under this thing. I Valk’d for 6 turns before dying. Sadly this took almost 20 minutes by itself. Game 2 I went in first with nothing, but terror for this trap card. I sided in Gungnir and the 3rd MST and summoned her turn 1. Gungnir destroyed the first Igknight to enter the scale (which I feel was a misplay in hindsight since my opponent, of course had another one). I Valk’d his attack and he ended by bouncing Gungnir with Ptolemy M7. I dealt with the established board with Exciton (another card I’m crying over losing). He passes and I attack with both Exciton and Unicore before they died to Raigeki. We both go into top deck mode until I win with Cowboy with 2 minutes left in time. This caused us to start Game 3 in turns. My opponent started off with Royal Magic Library and was able to end his turn with Stardust Spark and 2 high defense Igknights and a full scale. This was where I messed up. I thought I would be safe as along as I had a Valk to block his attack. I could’ve made Gagaga Cowboy and passed with Valk back up, but instead I through up Trish (no effect), and Decisive Armor. They failed to crack his board and I ended with a Senju in attack mode. On my opponent’s turn they made #86 Rhongomiant and ran over Senju dealing me 1600 damage. I couldn’t block Rhongomiant or kill it on the subsequent turn causing my defeat. This was probably the most intense series of duels I’ve had in ages. My opponent was amazing and I thoroughly enjoyed our match. I was a brick of salt however, which led to me playing FoW for the rest of the night. I won’t give up on Nekroz. Honestly, it exists as a constant reminder that nothing in Yugioh can last or that at the very least it can never be truly easy. 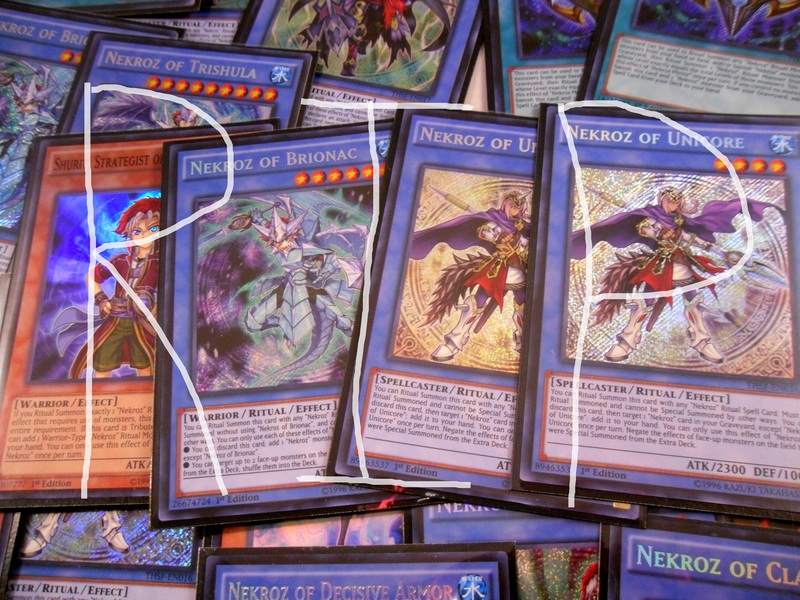 Do I think Nekroz will still work for the November 2015 format? I mean I’m certain someone can magically make it function by innovating the deck (cough cough Gem Knights), but I’m not ready for that challenge right now. I was never able to sell the Infernoid deck I built and now I know why. I always felt a love for this deck due to its raw power and overall easiness to play (also blogging from ages ago about building this, Nekroz and Heroes). The problems with Infernoids are huge, but they weren’t touched by the banlist and probably never will (Unless Reasoning gets hit). I have pretty much everything for the deck so it’s just a matter of actually playing it. Anyway, (as is my method) the only way to overcome sadness in Yugioh is to just go play Magic. I’m heading to the SCG Open today to draft and hopefully open the Expedition lottery which I literally decried only a post ago. Come to think of it I said I wouldn’t build another meta yugioh deck again too. At least I haven’t been sucked back into Standard! Uh I think it’s time to pack. Thanks for reading as usual.